Why: Because we need a new generation of the purest mass market sports car extant. In the parlance of former Defense Secretary Donald Rumsfeld, there are some unknowns we now know about the fourth-generation Mazda Miata. 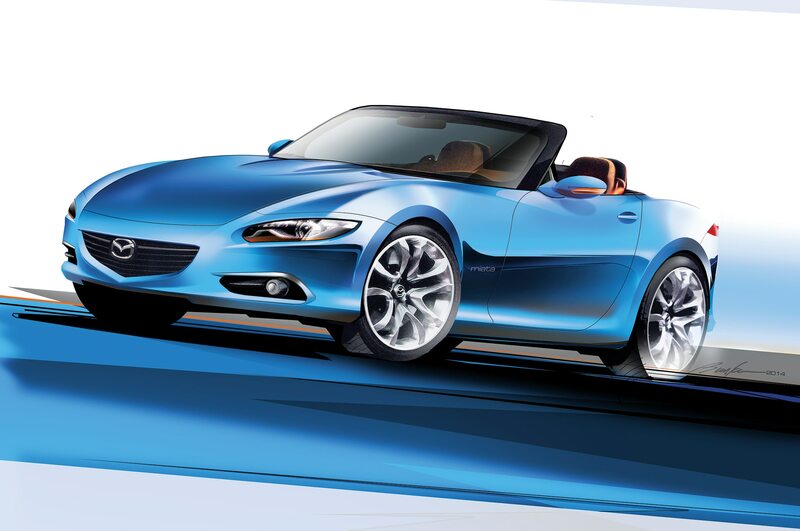 Artists’ renderings speculating about the look of the next sports car have been too literally Kodo, the design language that defines the look of Mazdas 3 and 6, says a source familiar with the redesign, who does not work for the automaker. Instead, the 2016 Mazda Miata will have clean, flowing lines that hark back to the 1990–96 MX-5. Due to the combination of modern pedestrian protection standards and evolving tastes, those heritage lines will not include the original’s pop-up headlamps, however. The new car will be lighter. The aluminum-intensive rear-wheel-drive Miata chassis that Mazda unveiled at the New York International Auto Show contributes to a 220-pound diet for the long-running roadster. Mazda’s promised weight reduction brings the mass of a base, softtop Miata to a projected 2260 pounds. The new car will also have dimensions more in line with the original, Mazda says. The 2006-15 Mazda Miata’s wheelbase is 2.5 inches longer than the 1990 model’s, and the car has grown 1.9 inches in overall length and 1.8 inches in width. The track is 3.2 inches wider in front and 2.7 inches wider at the rear. Track and wheelbase are dimensions Mazda really doesn’t want to reduce, as they make up a car’s “footprint.” The larger the footprint, the more leeway in meeting strict 2016 and 2025 Corporate Average Fuel Economy standards. Based on the latest spy shots, we can predict a slight increase in overall length, mostly in the hood and nose. The trunk should remain about the same length, to package the optional folding hard top. Expect a slight reduction in height to enhance the pure sports car look. Just a couple of inches in each direction will make the car look longer, lower and wider. We also know from the spy shots that the current Mazda Miata’s five-lug wheels will be replaced with four-lug wheels. Mazda’s promised weight reduction brings the mass of a base, soft top Miata to a projected 2260 pounds. The new Miata’s engine. We expect that the current 2.0-liter DOHC four-cylinder will be replaced with a Skyactiv direct-injected unit again with variable valve timing. Bet on a higher-revving version of the Mazda 3’s 2.0-liter, which makes 155 hp at 6000 rpm. The current Mazda Miata’s engine produces 167 hp at 7200 rpm (or 158 hp at 6700 rpm with the, ahem, automatic). That 167 hp is the figure a new 2.0-liter Skyactiv must meet, although because of the car’s weight reduction, we don’t expect much more power than that. Instead, the priority is to improve on the current Mazda Miata’s 21/28 mpg. Expect the five-speed manual to be shelved to make space for a six-speed manual as the base transmission. That our illustration is close, not just because we want to be right, but also because that makes for a design that will serve the car well into the ’20s. We don’t need a big screen in the center of the dash for a navigation system, nor a plethora of electronic driver’s assists. Plugging in a Garmin or a TomTom works in this tight space, and Mazda need not include a rearview camera until necessary, in 2018. Finally, there’s no reason for Mazda to spring for an expensive dual-clutch automatic. The six-speed manual will do. What about the Alfa Romeo Spider? Fiat Chrysler CEO Sergio Marchionne has scuttled a Hiroshima-assembled, Miata-based, Fiat-powered roadster—for Alfa Romeo, anyway. It appears the car will be a Fiat-Abarth instead, launching in late 2015 and sold alongside the Fiat 500 in North America. It may be called “Fiat 500 Sport” or perhaps “Fiat 500 Sport Abarth.” It will need something other than a traditional Alfa grille, but most styling done for the Alfa should translate. Word is that Alfa was going to take the car without the hardtop option as one way to distinguish its version from the Mazda Miata; expect that strategy to carry over to the Fiat.